Many years ago on a PC that ironically still works today despite sitting in an attic for well over a decade, there was a certain game that could easily eat up hours of my time. That happened to be Beach Head 2000, a rather simple game that saw players defending a beach from an ever growing invasion of enemy soldiers, vehicles, and much more. Now Mastiff Games has brought out a game that at least appears to bring back that same feeling in the form of Heavy Fire: Red Shadow, but will this game manage to hold out? Heavy Fire: Red Shadow provides players with a cursory bit of storyline that is so schlocky that it is almost campy in nature as we see a conflict between the United States and North Korea reach the point of no return. Each of these little story snippets are told between stage transitions of which there are eight in total, though only four are actually unique as each stage has a day and night version. 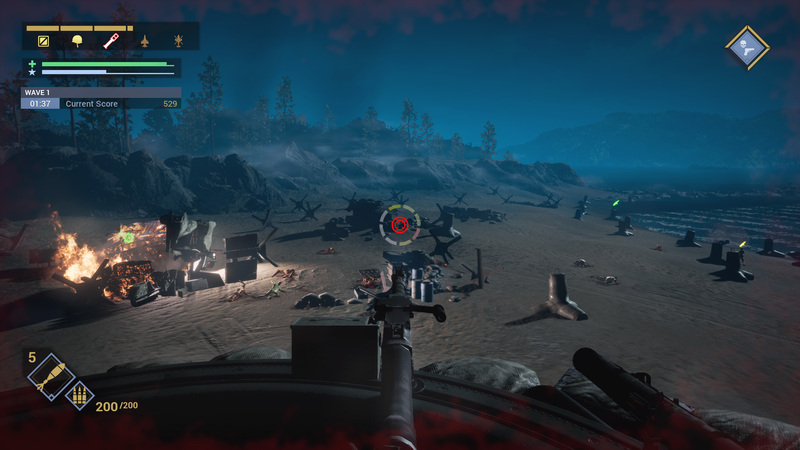 Heavy Fire sets itself apart from other entries in this series’ history by, as mentioned before, places players in a single turret that has a complete 360 degree view of its surroundings. 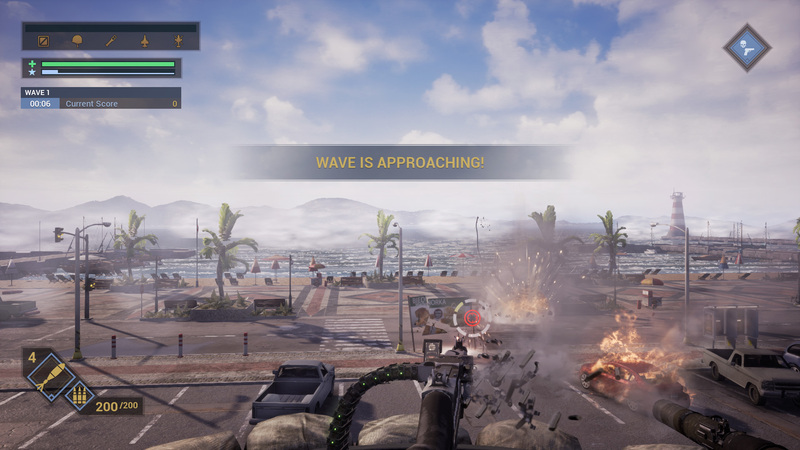 With an infinite amount of ammunition for your machine gun placement, a rocket launcher that gains ammo at a rather quick pace, and a radio to call in various bits of backup and perks it is up to you to survive wave after wave of enemy forces that are willing to take down the gun placement even if it means blowing themselves up along with it. As such the basic gameplay is very simple in nature as players mow down all of the enemies approaching them while trying your best to survive. As you take down enemy soldiers, trucks, ships, and even explosive mini-vans you’ll earn bits of XP that can allow players to eventually apply various perks to improve the capabilities of your weaponry or reinforce your health. For the most part Heavy Fire: Red Shadow is a rather easy title once you get the hang of things and with some of the perks offering things such as no longer needing to reload or making your basic ammo deal explosive damage you’ll likely only feel the challenge near the end of waves or during the final pair of stages. The other aspect that makes things a bit easier is the ability to call in support elements after killing enough enemy forces. 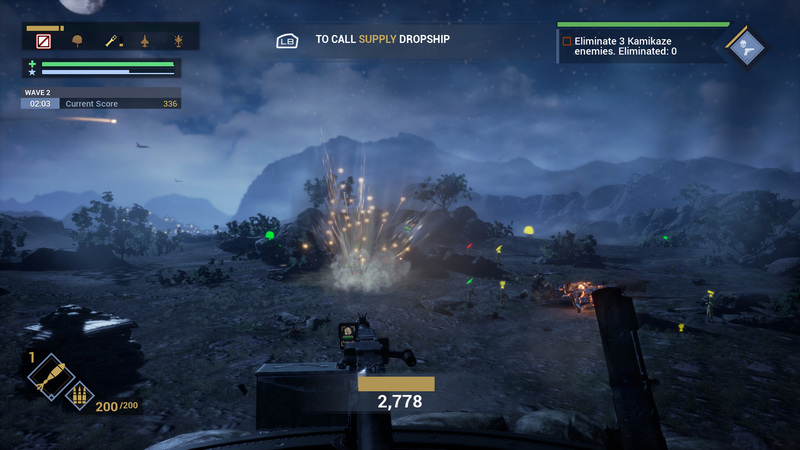 Players have the option to simply use the basic elements of support such as bringing in a supply drop or choosing to build up to higher levels of support and bring in attack helicopters, mortar support, and even some ally soldiers to reinforce your position. While going through stages various side-objectives such as killing certain enemy types or killing enough enemies fast enough will give players additional xp or support gauges. As a whole, Heavy Fire: Red Shadow does its best to make sure that players feel like they can take on these forces as standard enemies quickly fall to machine gun fire and rockets can tear apart all different types of armored vehicles, especially when you take on the Endless Mode that allows you to keep playing until you end up being eventually overwhelmed but one thing that does strip players of their power happens to be the amount of glitches that appear and surprisingly floaty aiming mechanics. 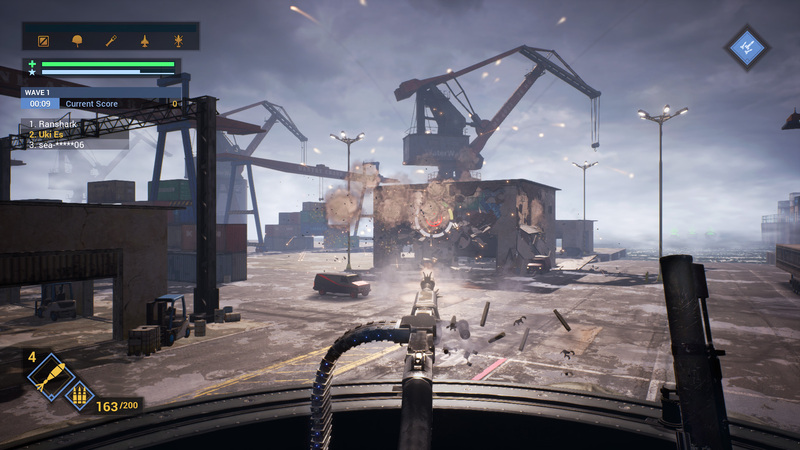 Players primarily aim by using the left analog stick to turn and aim their machine gun and rocket launcher while the right analog stick allows for fire aiming. The problem with this is that while turning and trying to aim at the same time the game will often send the targeting reticle either into a corner of the screen or in an entirely different direction from where you wanted to aim. As far as glitches go players will see enemy vehicles acting incredibly odd as they speed around the map and randomly crash at times and this type of enemy pathing is also an issue as there have been more than a few times that I’ve had to restart a stage simply due to the fact that a single enemy would never actually materialize. Thanks to the reticle featuring a warning system of how close enemies are players always know at least what direction enemies are coming but thanks to this it is obvious when a soldier or vehicle ends up stuck behind a mountain or piece of building and never enters a place you can destroy it, forcing a restart to actually progress and hope the enemies don’t glitch out. With only four real stages on offer players shouldn’t expect too much real variation here and even the enemy vehicles and soldiers are fairly simple looking in nature. One thing that is a nice touch is the fact that most objects in the environment are destructible, outside of some very strange exceptions. The standard voice work is fitting at best with a standard fair of background music for a budget title such as this one but one must mention just how ridiculous this game happens to go with its R Lee Ermey impression for the commander that players will spend most of their time listening too. Heavy Fire: Red Shadow is the type of game that does its best to emulate a power-trip that, at least in short bursts, happens to work quite well. Unfortunately a lack of stages and a multitude of bugs that often puts a stop to the wave based combat puts a damper on the fun, especially since this type of game really does only have so much to offer and even at a cheaper price point this game ends up offering too little to really last beyond some minor fun that quickly ends up being quashed. 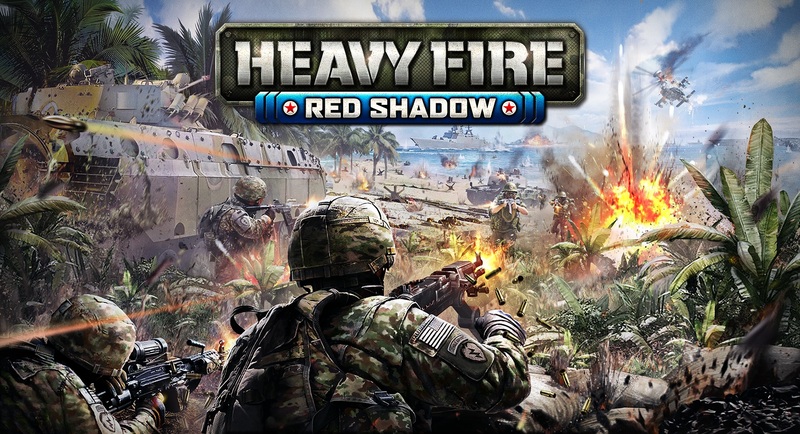 Heavy Fire: Red Shadow may offer players plenty of power to mow through the wave based combat but between a lack of variety and a multitude of glitches this is one that is only for those looking for a simplistic shooter that might be fun in short bursts but little more than that.